Windmills, tulips and clogs are some of the archetypical symbols that come to mind when we think of Holland. So when the opportunity came to see a real life Dutch windmill, I made a trip to Zaanse Schans so that windmills are no longer just images on tins of cookies and chocolate wrappers. Our 15-day river cruise starts from Amsterdam so we had time for some sightseeing before our boat makes its journey to Budapest. If you are looking for things to do in Amsterdam you can join a tour that will take you to Zaanse Schans. Zaanse Schans is a museum village dedicated to preserving the traditional Dutch way of life. Situated some 9 miles north of Amsterdam on the banks of the river Zaan, the village was created in 1960 when urbanization threatened the demolition of traditional buildings and these were then moved to Zaanse Schans. It’s interesting to note that this was the exact location where in 1574 Diederik van Sonoy, with the aid of locals, erected entrenchments or Schans to hold back the advancing Spanish army. Zaanse Schans is operated as a piece of living history and here you’ll get to experience the workings of a traditional windmill. Climb the narrow and steep staircase to the top of the windmill and it’s amazing to hear the loud flaps of the trellis-work and canvas sails. Windmills had many uses, including grinding corn and crushing seed to make oil. Mills at Zaanse Schans include a mustard mill and the last working oil mill in existence. In Zaanse Schans, the locals operate the windmills themselves. 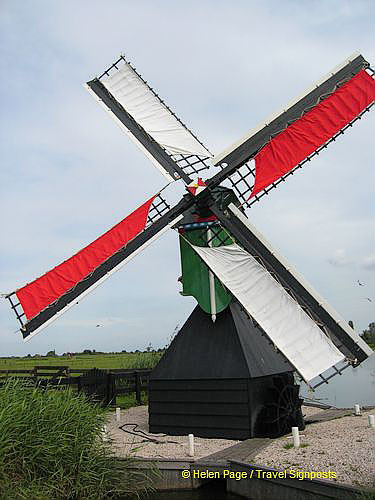 The energy from the windmills are also used to grind minerals to make pigments used in paint. The rotating cog operates an adjacent wheel to transmit power. When you’ve seen enough of windmills, you could pay a visit to Catharinahoeve. Here you’ll have a presentation on how cheese is made in the village. You’ll then have time to walk around the gift shop which is packed to the brim with very attractive souvenirs and foodstuff. The cheese packs are very tempting, but with a two-week river cruise in front of us, the additional calories are hardly necessary. Certainly if you are hunting for presents or souvenirs, you’ll find a great choice here. Our next stop is a demonstration of clog-making. Here our craftsman explains the clog-making process and as he’s doing his explanation he actually turned one out in an amazing two minutes. I’ve always wanted to own a pair of these Dutch clogs but on lifting a pair, they’re actually quite heavy. Commonsense says that it’s not a good way to start the holidays by accumulating bulky souvenirs, so, I sacrificed my Dutch clogs. It’s nice walking around the village and, time permitting, you can even do a cruise on the Zaan. Zaanse Schans gives a cultural insight as to what village life looks like in the seventeenth and eighteenth centuries and what a good way to start your Amsterdam holiday.